Computer giant Apple is recalling 1.8m batteries used in its laptop computers worldwide after overheating complaints. The announcement affects laptop computers - the iBook G4 and Powerbook G4 - sold between October 2003 and August 2006. It follows Dell's decision to recall more than 4m batteries from its laptops last week. The recall does not affect the company's latest line-up of laptops - the MacBook and MacBook Pro. "We discovered that some Sony batteries in previous models of PowerPC-based iBooks and PowerBooks do not meet Apple's standards for safety and performance," Apple said in a statement. "Our number one priority is to recall and replace the affected batteries free of charge." According to US safety officials, the batteries were made by Sony, which also supplied similar batteries to Dell. Apple spokesman Steve Dowling said that Sony, as the manufacturer of the recalled battery packs, "is responsible". While Apple is not expecting any "material financial impact" from the recall, Sony predicts that the recall of its Dell and Apple batteries will cost the firm between 20bn and 30bn yen ($172m to $258m). However, the news comes at a time when Apple has been in the headlines for stock option irregularities. After posting strong quarterly profits in July - up 48% on a year earlier - the firm warned in August that it would likely revise its financial results since 2002, after an enquiry found mistakes in the way staff were awarded shares in the firm. The firm said that all financial statements from 29 September 2002 "should not be relied upon". The latest recall was prompted after Apple received a total of nine complaints from users reporting "overheating" of the batteries. The announcement was made by the United States government's Consumer Product Safety Commission, which said two of the nine users reported minor burns from the machines. 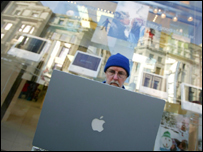 In the US, 1.1m machines are affected with a further 700,000 Apple laptops sold overseas also involved in the recall. The recall is believed to be the second-biggest in US history involving electronics or computers. Apple shares closed up 0.74% at $67.91 - boosted by the news that it would not be financially affected by the recall - but Sony shares slipped 2.61% to $43.26.